“After I graduate, my first goal is to work for the American Cancer Society,” says sophomore public policy major Kathryn Miller, an 11-year veteran of Relay for Life. Miller first heard about Relay for Life when she was only in fourth grade, and immediately became involved. Throughout high school in her hometown outside of Philadelphia, she served as the chair of survivorship, a position that she now holds at Syracuse as well. 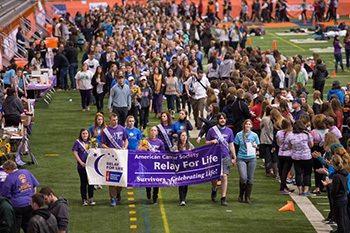 Participants march at the beginning of last year’s Relay for Life in the Carrier Dome. At Relay for Life this Saturday, teams of students will set up camp on the Carrier Dome field for the 6 p.m. to 6 a.m. event. These teams are each responsible for their own fundraising in the weeks leading up to Relay, and can also raise money during the event. While Relay for Life is taking place, each team must have one member walking on the track at all times. Throughout the night there are slideshows, music, yard games and food, both homemade and from Marshall Street vendors. “Cancer never sleeps, so why should we?” asks Miller. “That’s really the big idea behind Relay.” She goes on to explain that Relay for Life is both a fundraiser for the American Cancer Society and a community event, with over 4 million participants in over 20 countries worldwide. The event is localized; independent volunteers work with the American Cancer Society to plan and execute Relay for Life in their respective hometowns and schools. So far, 92 teams have signed up for the Syracuse University Relay for Life, collectively raising over $52,200 as of April 16. And that’s only the fundraising that’s occurred outside of the event. Teams can use any number of creative strategies to raise money during Relay, including renting out sporting equipment and board games, selling ribbons and other homemade souvenirs and hosting bake sales from their team’s campsite. All of the money raised will go to benefit cancer research and treatment. Miller’s commitment didn’t come out of the blue. She is inspired by two of her former teachers: her band instructor, who created her love of music; and her gym coach, who sparked her passion for field hockey, a sport she still plays. Both teachers were diagnosed with cancer, and while Miller’s gym coach is still fighting, her band instructor passed away four years ago. Interested students and faculty can still sign up and participate in this Saturday’s Relay, and even people not on a specific team can still attend for all or some of the event to show their support. Visit the Syracuse University Relay for Life Facebook page for more information and a link to the signup page.